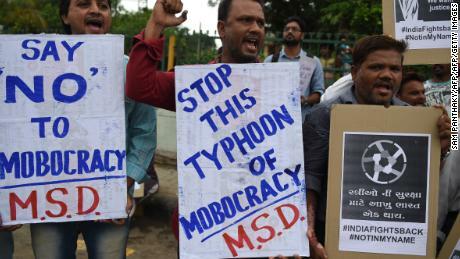 The shootings are the latest in a wave of mob violence branded as “cow vigilantism” that critics say is growing on Prime Minister Narendra Modi’s watch. Clashes between villagers and police broke out in the northern Indian state of Uttar Pradesh after cow carcasses were allegedly discovered in a village near the city of Bulandshahr, about 46 miles from the capital, New Delhi. India’s majority Hindu population consider cows to be sacred animals and most states, including Uttar Pradesh, have banned their slaughter. 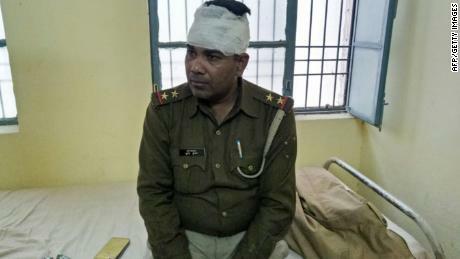 Hundreds of protesters gathered on a highway and began pelting officers with stones, demanding police take action over the alleged cattle deaths, Inspector Rajeev Kumar Gupta, of Meerut police, told CNN. “The police had to resort to firing their guns in the air,” said Gupta. In the ensuing violence, a police officer, Subodh Kumar Singh, and a local man were shot and killed. Singh was shot in the head, according to the autopsy report. Police said they have arrested three people and are looking for another 24 thought to be involved in the violent clashes. A special investigation team has also been formed to find out who started the violence. The Uttar Pradesh government said it would compensate the family of the slain officer with 5 million rupees (around $71,000) as well as a government job and pension. Mob attacks involving so-called cow vigilantes have increased in India over the past few years, with groups brutally beating or lynching those — particularly Muslims and other minorities — suspected of killing or transporting cows for slaughter, or for eating beef. One of the highest profile cases happened in 2015, when Mohammed Akhlaq, a Muslim blacksmith and resident of Uttar Pradesh, was beaten to death by an angry mob. His son was also critically injured in the violence, after rumors spread through their village that the family had slaughtered a cow. Fifteen people were charged for his murder in a case that prompted national outrage. 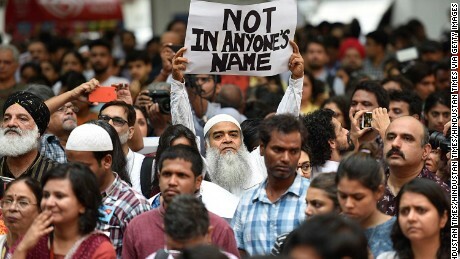 A string of similar attacks in the years since has sharpened fears about the spread of Hindu nationalism in a country that is home to more than 170 million Muslims. Modi’s government has come under intense criticism for not keeping the vigilante groups in check and for what critics say is a lackluster response to the attacks. Still, the rise in mob violence has coincided with the electoral success of Modi’s ruling Bharatiya Janata Party (BJP), which critics say has helped foster a culture of religious intolerance since coming to power in 2014. Modi’s BJP is strongly aligned with the country’s conservative Hindu nationalists, the more extreme elements of which believe India should be governed in accordance with strict Hindu beliefs. Leading up to the 2014 national elections, Modi campaigned on the promise of ending a “pink revolution” — a phrase describing the slaughter of cattle across the country. “When animals are slaughtered, the color of their flesh is pink, and that is why it is called the ‘Pink Revolution,'” he said at a rally in the eastern state of Bihar. The issue has become a tinder box for the historically fraught relationship between Hindus and Muslims in the country, where communal violence between the two communities is common. In 2017, at least 111 people died in more than 800 communal attacks in India, according to government statistics. The state where the most recent attack occurred, Uttar Pradesh, saw the biggest nationwide increase in communal violence that year, with 44 deaths in 195 reported incidents.